The beauty of thermal insulation is that it pays for itself, and then lowers your energy costs. 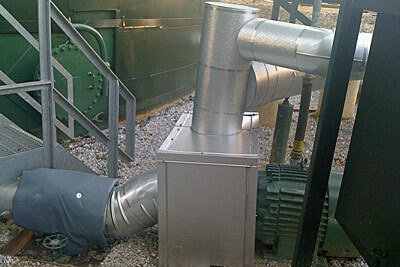 It does this by reducing heat transfer between the pipe and surrounding environment. As a result your system will perform more efficiently with less heat loss or gain to be compensated. Similarly, insulation allows greater control to maintain process temperatures at the desired level. Properly sized insulation helps control water condensation on cold pipe surfaces and limits corrosion. To do this requires keeping the outer insulation surfaces at a temperature above the dew point of ambient air and creating a barrier to stop moisture penetration from reaching the pipe. BIG also offers specialized protective pipe coatings for further corrosion protection in problematic areas. Cold temperatures put your pipe system at risk for freeze/thaw damage when internal condensation and water freeze. Properly sized insulation significantly reduces the chance of a pipe break by increasing the time required for water to freeze. 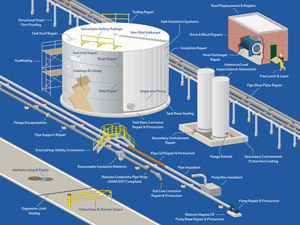 Insulation can be used to lower the outer surface temperature of process pipes and vessels to a safe level, reducing the risk of worker injury. For heavy-duty industrial applications, we use aluminum-jacketed insulation for its durability and water resistant characteristics. Our selection of proven insulation materials includes: Fiberglass, Foamglas and Calcium Silicate, which suit a wide variety of applications. We also offer water resistant Belzona® Lag Seal coated insulation. Typical application is usually 2-inch thick with a .016 thick aluminum cover. Use for hot or cold applications ranging from 0°F to 850°F. Advantages: least expensive, easy to work with. Disadvantages: will lose insulation properties if it becomes wet. Easily crushed if the pipe is stepped upon. Typical application is usually 2-inches thick with a .016 thick aluminum cover. Use for hot or cold applications ranging from -450°F to +950°F. Advantages: water resistant, will not lose insulation properties if it gets wet. Will also dry out if it gets wet. Better for higher temperature pipe compared to fiberglass, more durable than fiberglass. Disadvantages: very expensive, labor intensive to work with. Can not be used on pipes exposed to vibration, which will turn the Foamglas to dust. Typical Calcium Silicate (aka cal-sil) application is usually 2-inch thick with a .016 thick aluminum cover. Use for high temperature applications ranging up to 1200°F. Advantages: resistant to crushing from foot traffic. Disadvantages: higher cost than fiberglass, not water resistant. 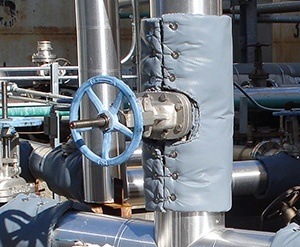 Typical application is usually 2-inch thick fiberglass with Belzona® Lag Seal covering. Advantages: water and weather resistant, fire resistant, less expensive installed cost than Foamglass, applies with a paint brush or roller, has a glass reinforcement sheet between coat 1 and 2, flexible, repairable/patchable, seamless, micro-porous allowing moisture within to evaporate. Disadvantages: will not have same strength as Foamglas or Cal-Sil, more expensive than fiberglass, currently not a commonly used method of insulation. Fill the energy wasting gaps where jacketed insulation can not be used. 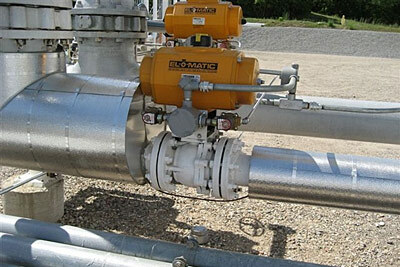 BIG custom tailors and installs insulation blankets to fit pipe valves, reducers, traps, stainers, expansion joints, pumps, heat exchangers and more. 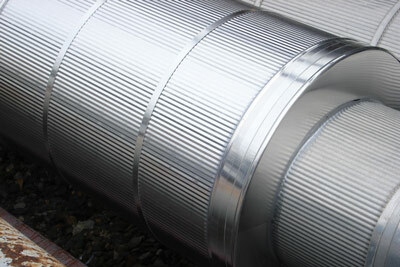 Our covers are easy to install, remove and reinstall for speedy maintenance work. Call today for more information. 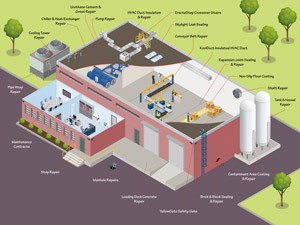 We start by examining the operating conditions and calculating insulation thickness, heat loss or gain, surface temperature, and other environmental considerations. This lets us configure an optimal solution to best meet your specific requirements. Our design software will show you return on investment for fuel cost savings, bare vs. insulated heat loss efficiency percentages, installed cost, maintenance, and other costs. Next, our experienced crews provide expert installation with minimal disruption to your facility. The end result is a cost-effective and energy efficient insulation system designed for long-term, reliable service. Please contact us today for more information or to schedule service. Our lunch and learn program also provides one-on-one education on how to solve your maintenance needs. 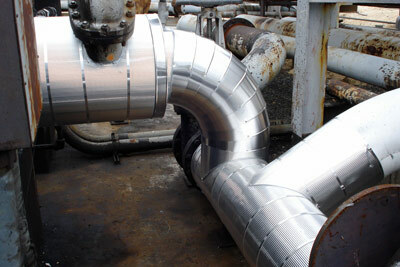 Insulated pipes at a petrochemical plant. Insulated pipes at a bio diesel plant. Custom fabricated pump box insulation.